Most of the time the client already has an idea that they want turned on. We help them with that. Other times we provide the idea and that turns our clients on. And sometimes the client has an idea that is already on, but they want it to be designed better, made brighter, more impacting. Don’t turn around, you are almost there! 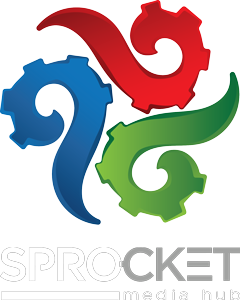 When all the gears are turning in integrated synchronicity, with power, and at peak efficiency, transfer of meaning and business transformation is exactly what happens inside of the Sprocket Q&A system. Regardless of the medium or format you need to transfer your message and whether you have a new business, product or service you want to put on the marketplace, at Sprocket Media Hub we first ask many questions. The purpose is to learn everything there is to know about you, your clients, your brand space, your market, your business model, and the direction in which you are moving. We do this because we know that only then, will we be in a position to find the answers to transform your business message and move it towards a profitable direction. If you are a Non-Profit Organization – We add movement to your cause. If you are an Advertising Agency – We engage, turn up, and increase the impact of your message. At Sprocket media hub, we transform powerless transactional messages into a powerful engaging relationship with your customers.